The Mount Prospect Police Department is asking the community for help with identification of a male residential burglary suspect involved in a residential burglary that occurred on Monday, February 4, 2019 at the Timberlane Apartments east of downtown Mount Prospect and just south of the Union Pacific railroad tracks. Mount Prospect Police burglary suspect sketch February 2019. Mount Prospect police officers responded about 12:08 p.m. Monday, February 4, 2019, at to the block of 600 East Prospect Avenue to a report of a residential burglary, where the victim was home. Upon arrival, officers spoke with the victim who was in the residence when the offender entered. The victim reported he heard knocking on the front door, which he did not answer. The victim then entered a bedroom after hearing a window slide open and observed the offender standing inside the room. The victim and offender exchanged words and the victim exited from the bedroom. The offender then climbed out of the window and fled the area in an unknown direction. 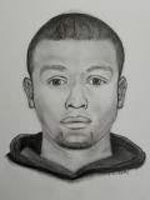 The offender is described as a black male, approximately 25 years-old, thin build, dark colored goatee, wearing a dark colored hoodie. The Mount Prospect Police Department requests all residents be extra vigilant and report any suspicious persons, cars or activity in their neighborhood by calling 9-1-1 immediately. Mount Prospect Police Department is also reminding all residents to lock their doors and windows, even when at home. Anyone recognizing this male subject is asked to call the Mount Prospect Police Department Investigations Section at 847-870-5654. Anonymous tips can be made to CrimeStoppers of Mount Prospect by calling 847-590-7867 or texting MPPD and your tip to 274637. Tips made through Crime Stoppers of Mount Prospect that lead to the arrest and prosecution of the offenders could be eligible for a cash reward of up to $1,000.